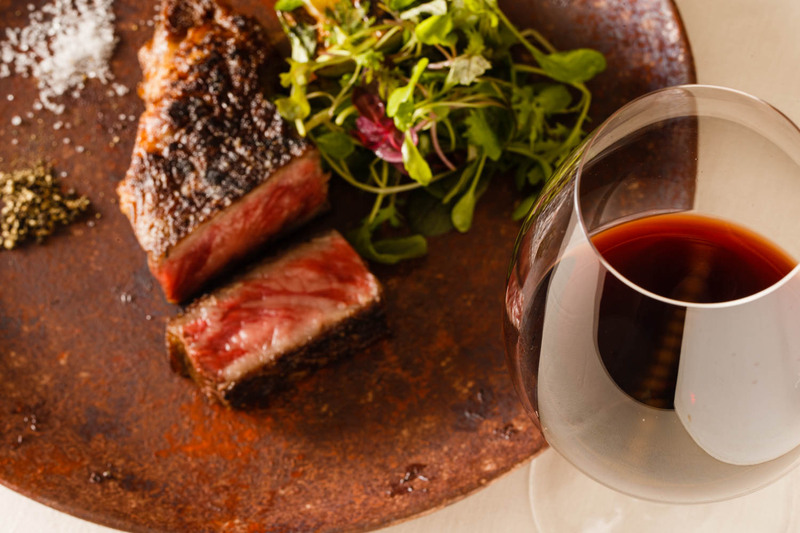 With the leaping flames of a wood-fired oven and the wonderful aromas of seared wagyu steak, freshly baked ciabatta, and grilled seafood, take a front-row seat at TACUBO and be treated to deeply flavorful, seasonal Italian cuisine as you watch the chef’s skillful hands and admire the brilliant colors of seasonal Japanese produce. 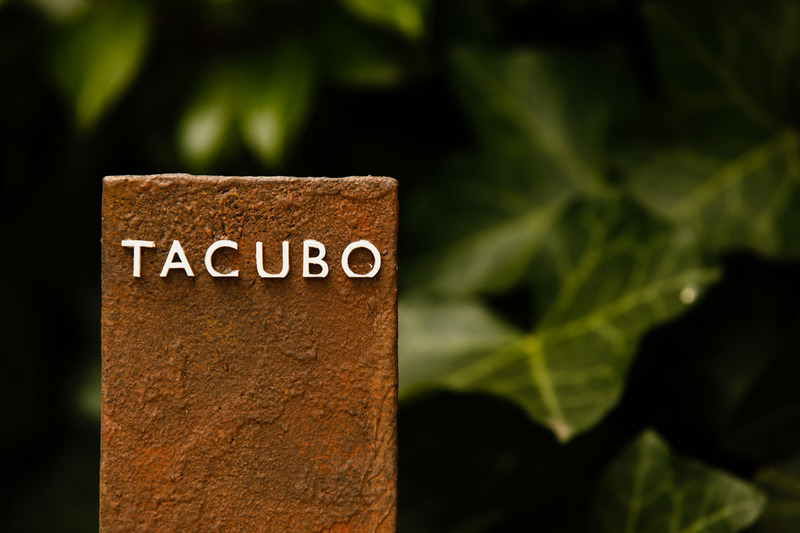 In the cute neighbourhood of Daikanyama, a favorite spot for artists and fashion designers, wind through the streets a short walk from the station until you come to a tiny oxidized wrought iron gatepost with the even tinier white letters of TACUBO. Open the heavy wrought iron door to hear the crackling wood and see the leaping flames of the wood-fired oven, and be instantly blanketed in comfort and warmth. The slate painted walls contrast with the white exposed beams of the low ceiling above which bundles of firewood rest, and the windows are lined with dried branches, herbs and flowers, bringing part of nature inside. The custom-made stainless steel kitchen is adorned with knives, microplanes, tongs and graters – every kind of shiny kitchen tool you can imagine. 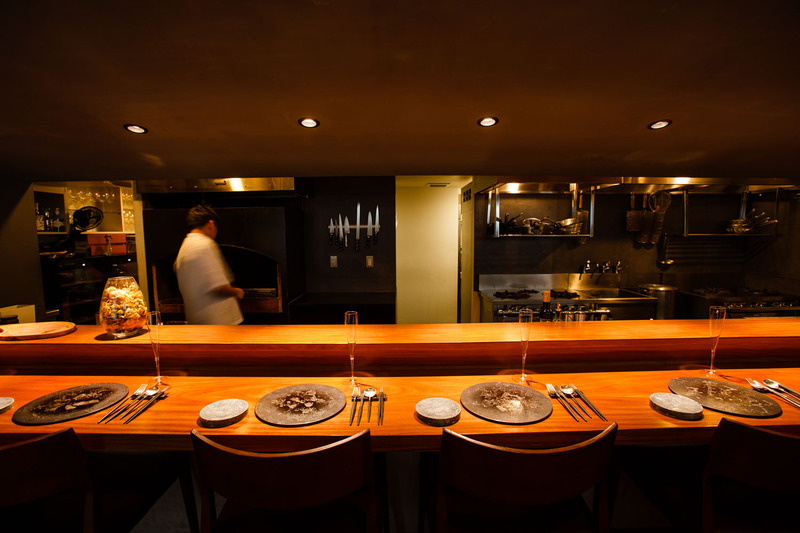 The eight-person counter of smooth varnished wood is dotted with cute farm animals, over which you have full view of the kitchen, and two private rooms overlook a soft green bamboo garden. With the mesmerizing flames of the open oven, you breathe in to truly enjoy the aromas. Roasting meat, bread, herbs, vinegars – the sights and smells are mouthwatering. Anticipation builds as you see the busy chefs kneading dough, rolling pasta, checking the confit, and getting ready to plate. The light, flavorful, seasonal Italian-inspired menu changes at irregular intervals, so you can look forward to something new every time you visit TACUBO, but the lovely chef is also happy to serve a favorite dish from a previous visit so you can relive that amazing food memory. 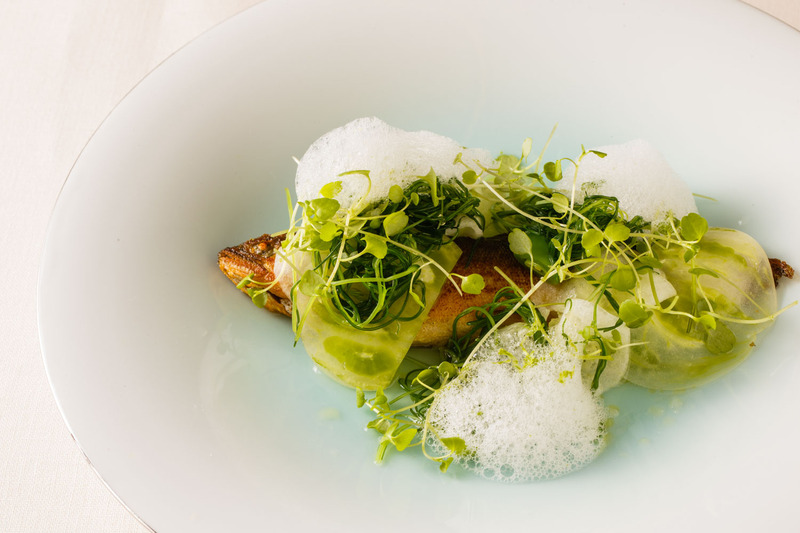 A summer course may begin with confit of ayu sweetfish pan-fried for a slightly crispy and golden outside, served with oka-hijiki (land seaweed), green tomato, snap pea sprouts, Kaga cucumber pickled in a combination of white wine, cider and white balsamic vinegars, cucumber foam, and the zest and juice of a lime. Cooling in colors of white and green, the refreshing flavors are in perfect balance. 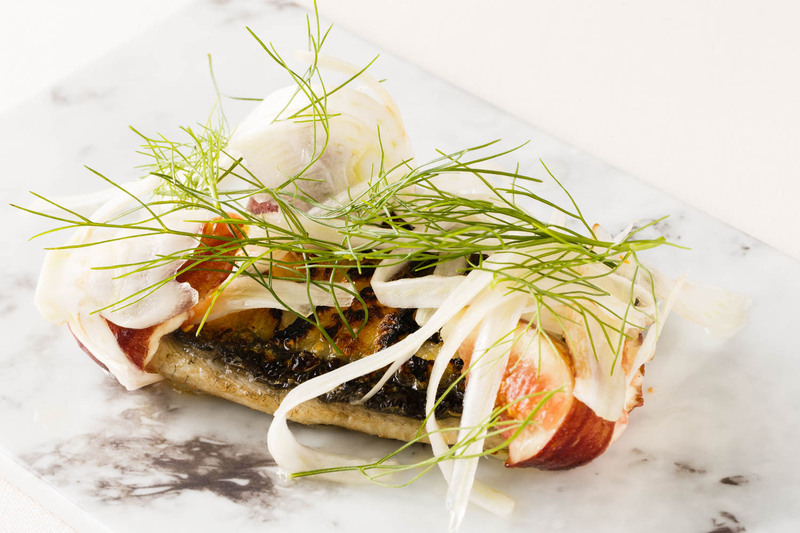 Wood-fired unagi eel with a crispy crunch on the skin side and an extremely succulent texture within, is served with fresh fig, fennel and fennel leaves. This dish reveals the secret of wood-firing: unlike charcoal, the wood does not dry out the flesh, capturing the moisture within for delicious umami-rich juices. You will probably be treated to two pasta dishes, perhaps starting with chilled capellini in a fresh tomato cream sauce made with clam broth and topped with plump amaebi. With a finish of lemon zest, lemon juice and lemon balm herbs, the dish has it all - acidity, sweetness, umami and that tiny touch of bitter. 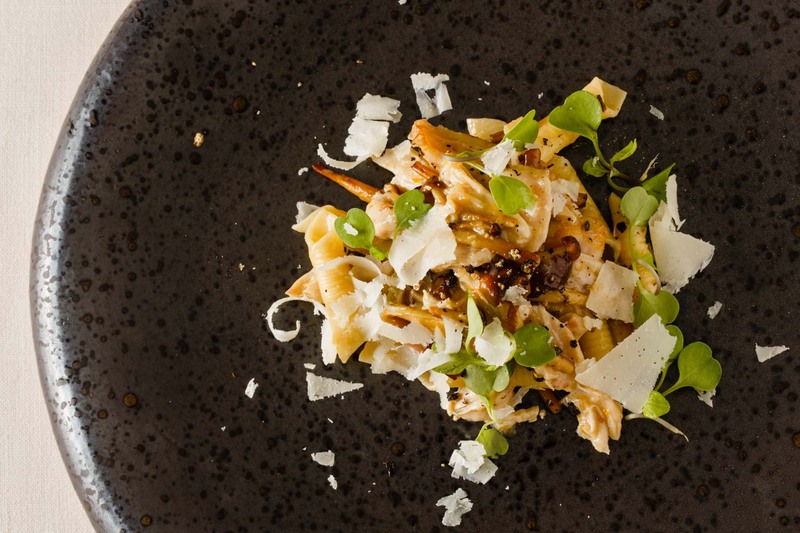 For a warm variation, handmade pasta squares are rolled into garganelli tubes and topped with a light, tender, and deeply flavorful baby rabbit ragu combined with a white wine-based sauce, wild enoki mushrooms, freshly grated parmesan, baby ruccola and plenty of fresh black pepper. And then the signature steak. 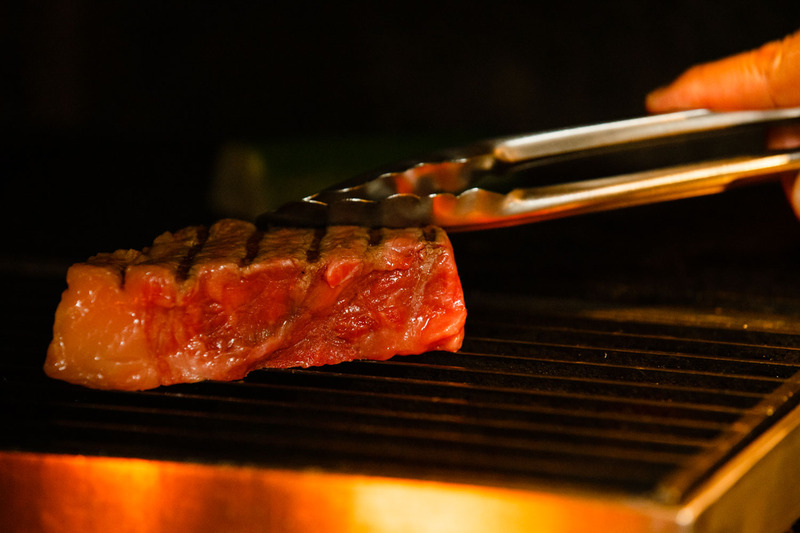 A thick-cut piece of Tokachi, Hokkaido or Kumamoto beef comes face to face with the wood coals, and Chef Takubo carefully tends to it, turning, pressing, watching. The naked meat does so well over the moisture-trapping firewood, and an open slice shows how the steak has been cooked to medium rare perfection. With a simple salt and pepper seasoning, served on a rustic brown plate with sprouts, grilled zucchini, and a squeeze of lemon all over, the signature steak dish offers scrumptious toothsome texture, with some sweetness in the aftertaste, and light freshness from the salad. 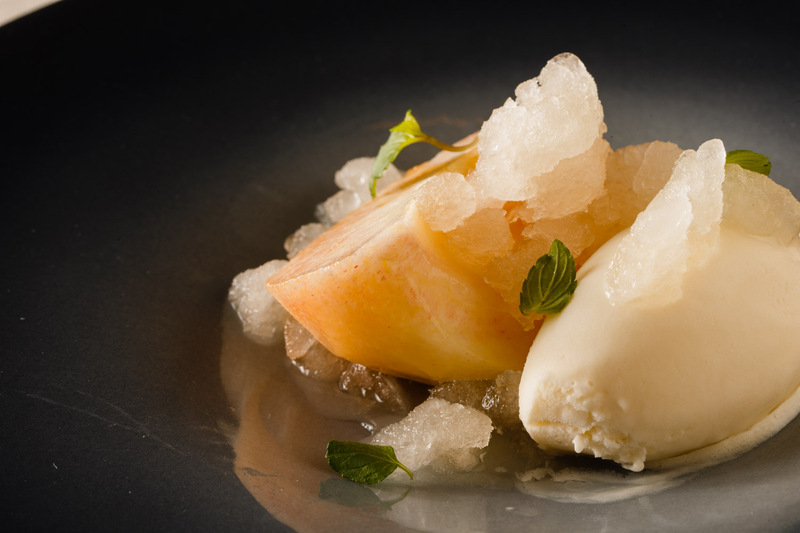 As the meal concludes, it’s time to cool down with the fresh and juicy flavors of a wedge of white peach, white peach compote, white peach and mint granita, and luxuriously creamy homemade white peach ice cream. The nara-no-ki oak firewood provides the perfect heat levels and a pleasant but not overwhelming aroma. The difficulty is in the timing. 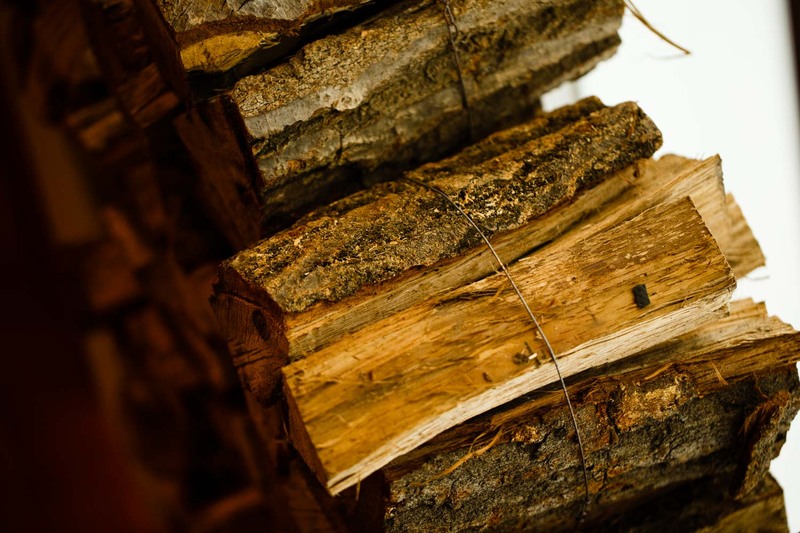 Firewood is prepared on one side and moved in small amounts beneath low metal blocks when it has achieved the key temperature for the particular protein to be cooked. The benefit of using coals from the fire prepared in this way is that they do not dry out the sides that come into contact with the heat. Proteins and produce come from all over the world, with a focus on Japan, and many producers visit TACUBO to introduce their ingredients. 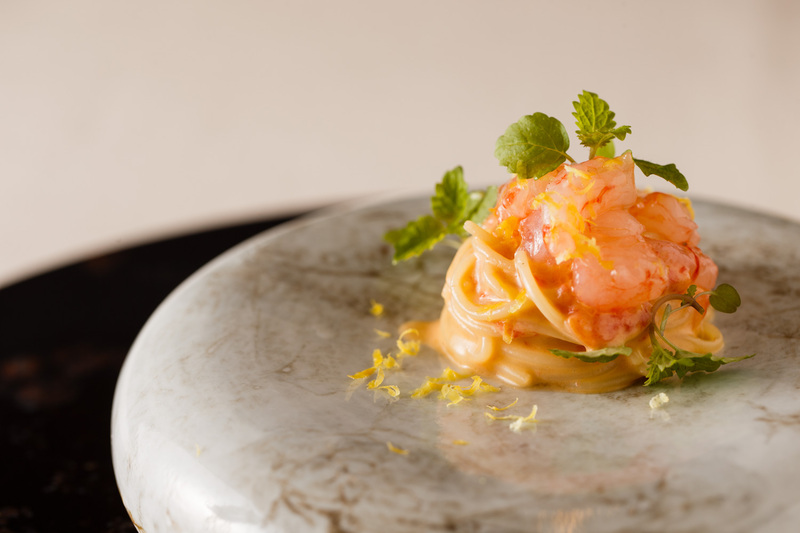 A significant number of ingredients come from the chef’s home island of Shikoku, famous for its citrus fruits, grapes and fresh seafood fished in the Japan Inland Sea, which is often referred to as ‘Japan’s Mediterranean’. 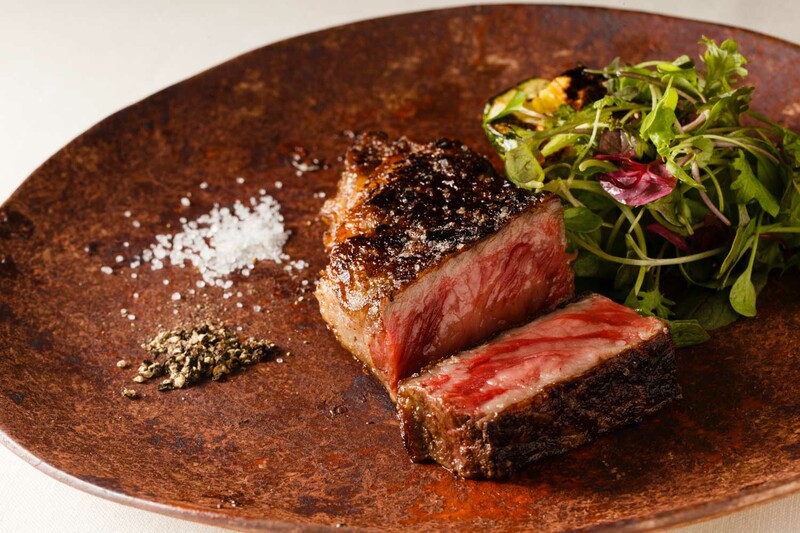 The beef for the signature steak comes from Kumamoto or Tokachi, and this latter Hokkaido beef is called ‘TACUBO -gyu’ – a cross between Wagyu and Holstein cattle, giving the best of both types of meat. The salt used to season the steak is farmed in Somalia, and most of the olive oils and vinegar varieties are Italian. Chef Takubo has countless jars of vinegar concoctions, and he knows instinctively without even looking, which one to reach his hand out to when preparing each dish. Born in Ehime Prefecture, Daisuke Takubo loved watching cooking shows as a child, so the decision to pursue a career as a chef was a simple one. Enrolling in Tsuji Culinary School straight out of high school with his sights set on washoku, Takubo’s preconceptions were rocked when he tasted his cooking school teacher’s pescatora pasta. 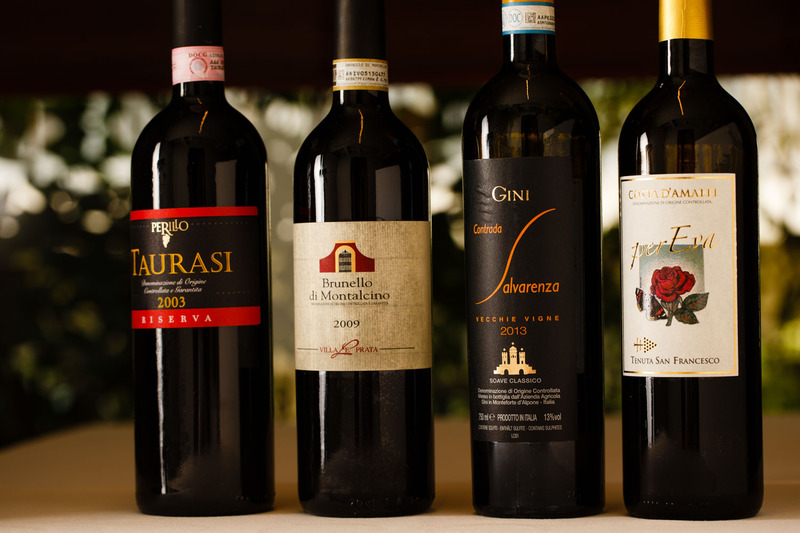 After working at one of Ehime’s best-known Italian restaurants for two years, a tour of Tokyo and its premier Italian restaurants instilled in him a sense of inferiority. He tasted Italian served in kaiseki-style, was introduced to new ingredients and came across familiar ingredients served in new ways. He felt the need to catch up. He trained in Aoyama and then spent seven years at Ginza’s Ristorante Aroma-frèsca. In these years, he was exposed to wood-fired cooking and it wowed him. Having always thought that charcoal was the best, his eyes were opened to the different expression proteins have when cooked in this way. Takubo finally felt read to go out on his own. He served as the chef in a few collaborative restaurant projects. Then, as proof of his challenging spirit and modern outlook, he decided to start a crowd-funding project, and that is how he came to open TACUBO. Chef Takubo dreams of finding the right person to take over his Tokyo kitchen freeing him to create and cook elsewhere in the world. He could move with the seasons, serving up delicious food to guests in Tokyo during autumn and spring, Hawaii in the winter and returning to an island in his home prefecture of Ehime in the summer, where on weekends only he would serve cuisine using local ingredients from the surrounding sea. It sounds wonderful. And with the success of TACUBO, the customers are bound to find Chef Takubo wherever he calls home. Elegant champagne flutes adorning the table before the meal commences excite you for the celebration of fine food soon to begin, and many choices of especially Italian and French wines and stocked in the cellar, ready to accompany your meal. The tables are set with stunning large round platters, and crisp white napkins rest on beautiful stone circles, both from Kamachi Toho, the famous Arita-yaki kiln in Saga Prefecture. Sleek, black-handled Cutipol cutlery lies on Kamachi Toho ceramic rests, alongside black chopsticks, proof of the strong Japanese sensibility infused into the cuisine: the delicate preparation requires delicate utensils to enjoy it. As the course progresses, not only is each dish unique and delicious, the tableware it is served on has a personality of its own. The glamorous marble rectangle highlighting the unagi, the bubbled black tones of the chilled pasta dish, the pale blue circle in the middle making the fish appear to be swimming – every element of the meal is eye-catching and mouthwatering. TACUBO course, with TACUBO beef at main and caviar pasta.